The classic design of this 3/4 twin size sofa sleeper is one your family and friends will enjoy for many years. At 65 inches, this sleeper sofa offers plenty of space to spread out and relax with three plump seat cushions, tufted seat back, and rolled arm. The twin size premium innerspring mattress ensures your guests a comfortable place to sleep. A skirt at the base completes the look of this timeless sofa. Multiple fabrics are offered so you can find the ideal fit for your space. 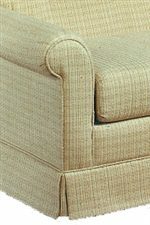 This sleeper sofa is available in Queen, Regular and 3/4 (Twin) size sleeper options. The 2000 3/4 Twin Sleeper Sofa with Tufted Seat Back by Lancer at Westrich Furniture & Appliances in the Delphos, Lima, Van Wert, Ottawa, and Celina area. Product availability may vary. Contact us for the most current availability on this product. Enhance your living room or family room with the casual style of the 2000 series. Plump seat cushions, tufted seat backs, rolled arms and skirted base provide comfortable seating and a classic design for your home. A loveseat, ottoman and full size sleeper sofa are also available to coordinate with the featured sofa, queen sleeper, chair and twin sleeper. Available in multiple fabrics, create the ideal fit for your space with the 2000 collection. The 2000 collection is a great option if you are looking for Casual furniture in the Delphos, Lima, Van Wert, Ottawa, and Celina area. Browse other items in the 2000 collection from Westrich Furniture & Appliances in the Delphos, Lima, Van Wert, Ottawa, and Celina area.